MABEL CORINNE LEAF (nee DAWSON) September 1, 1932 - April 26, 2011 Surrounded by her loving family our beloved wife, mother and grandmother, Mabel passed away suddenly at Seven Oaks Hospital on April 26, 2011 at the age of 78. Mabel is survived by her husband Tom, sons Glenn (Allison), Wayne (Karen), Bruce (Lyndy) and grandchildren Michelle and Ryan. She also leaves to mourn her passing, brother Bert (Audrey) of Beausejour, sister-in-law Shirley Brodie (Bruce) of Edmonton, sister-in-law June (Stu) Langdon of Kamloops, BC and many nieces, nephews and cousins. Mabel was predeceased by her mother and father Corinne and Bert Dawson of Winnipeg and brother Bob (June) of Kamloops, BC. In her younger years Mabel attended Riverview, Lord Roberts and Kelvin High School. Mabel was a wonderful wife, mother and grandmother. 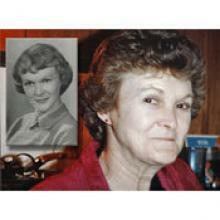 She was very sports minded and participated in all the sporting activities of her sons and grandchildren. She loved the Toronto Blue Jays and the New York Mets. She also enjoyed watching curling. When Mabel's vision became impaired about 10 years ago she had to stop playing bingo with her partners June and Rose. She loved traveling and spent many trips going to Las Vegas, Palm Springs, Yuma and parts of S.W. United States. She loved the pomp and pageantry of the United Kingdom and the blue skies of Puerto Vallarta and the Dominican Republic. Mabel was a very organized person regardless of her vision impairment. She was a very ardent reader and when her sight failed she obtained audio book tapes and CDs. Her favourite movie was Gone With The Wind . The family would like to take the opportunity of thanking her many longtime friends, Mabel Young, Rosalie, Shirley Tack, Betty, Joy, Dorothy, Gerry, June, Rose, Cousin Mary and Gail's Coffee gang . We would also like to thank Dr. J. Bergen and staff, the B4 and I.C.U. staff at Seven Oaks Hospital and Dr. Reimer. In accordance with Mabel's wishes cremation has taken place and a private service will be held at a later date. Flowers are gratefully declined, if desired donations can be made to the C.N.I.B. Winnipeg Division.